So why can’t I just enjoy the first meal of the day? I blame it on Hot Lunch. My Hot Lunch experience definitely had its fair share of fish sticks but I was lucky that my elementary school offered a program that was on the better side. I am not certain of this because I rarely got to enjoy it due to the fact that I had to bring my lunch in an assortment of tiny Tupperware containers which all packed into a reusable cloth lunch bag – may I add that this was way before all that jazz was cool. But I was relieved of these containers every other week when they served the Breakfast-For-Lunch meal. In my opinion this was the one meal that Bob* the lunch guy actually nailed and the only worth fighting with my parents for about letting me buy. Not that I blame him much because who am I to judge. His job was to make Hot Lunch for 100 children under the age of 12 and I don’t think we actually cared what we ate as long it included one of the three food groups: cookies, pizza and pepperoni. But Breakfast-For-Lunch was what it was all about. Having waffles at noon just made sense to me (and hello, this is what turned into what we now call brunch!). Plus it set the standard for having breakfast food no matter what the arms of the clock read. But given that the calendar year is off to a fresh start, whether we like it or not, reflections are probably going on inside your brain. 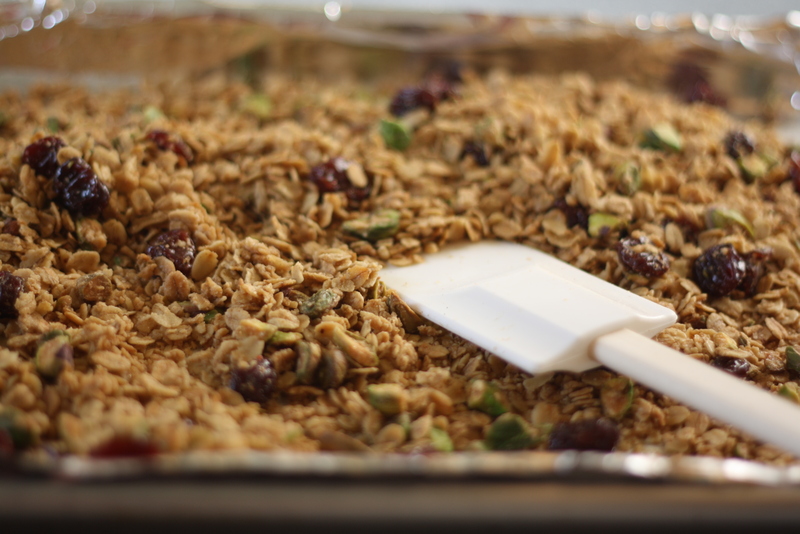 I’ve got better breakfast-ing happening in mine which is why I made this awesome granola. Maple syrup and olive oil provide just a touch of sweetness and flavor while cardamon and cinnamon make this granola shine. If you don’t like pistachios then swap in pecans or almonds or hazelnuts. Same goes with the dried fruit. Make this granola yo’ own. 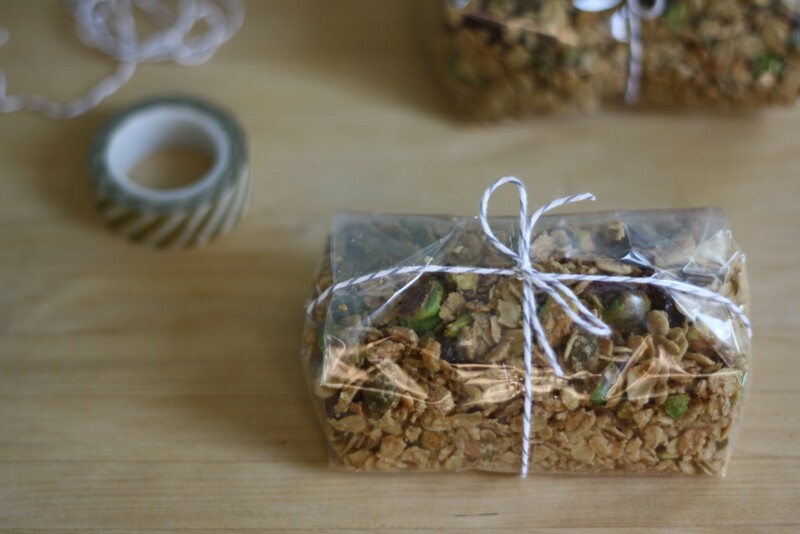 Granola is especially easy to make in large batches which means you can save a bunch for breakfasts then give the rest away as an anytime gift. I’m sure there is someone in your life who would benefit from a surprise bag of homemade olive oil granola just because it is Thursday. *This may or may not be correct. Meals I can remember, names I cannot. Preheat the oven to 300 and line a rimmed baking sheet with foil. Set aside. 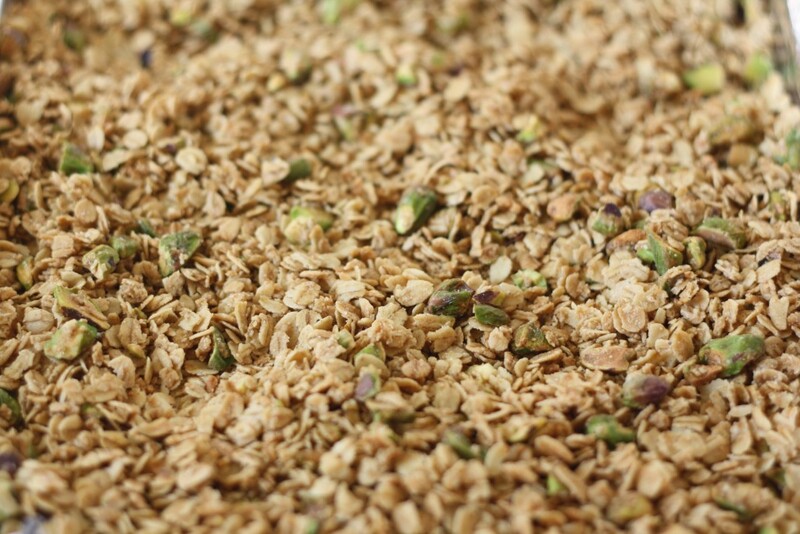 In a large bowl mix together oats, pistachios, brown sugar, salt and spices. In a liquid measuring cup whisk together olive oil and maple syrup, pour over the oat mixture, and stir well until evenly coated. Spread the mixture onto the prepared pan and pat into a single layer. Bake for 45-50 minutes, stirring every 10 minutes, until the oats are toasty and lightly browned. Remove the pan from the oven and set on a wire rack to cool. Sprinkle with a few generous pinches of salt and sugar, if using, and stir to combine. 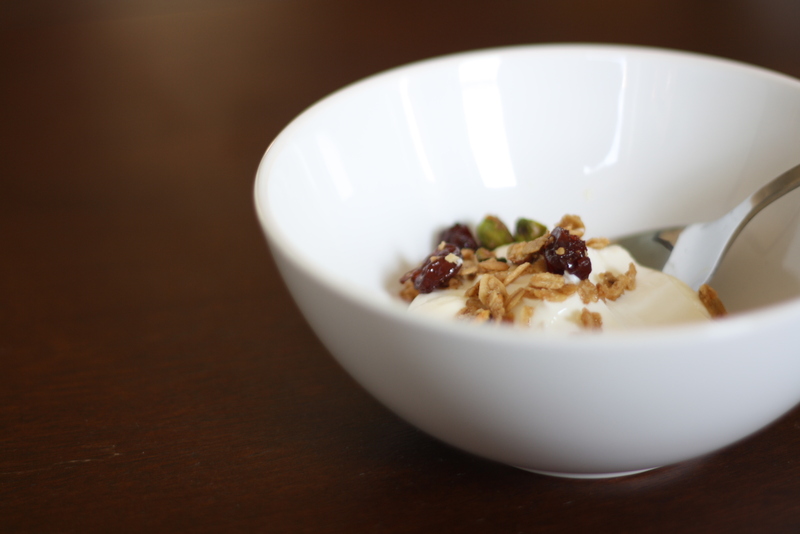 When the granola has cooled completely, mix in the dried cherries. 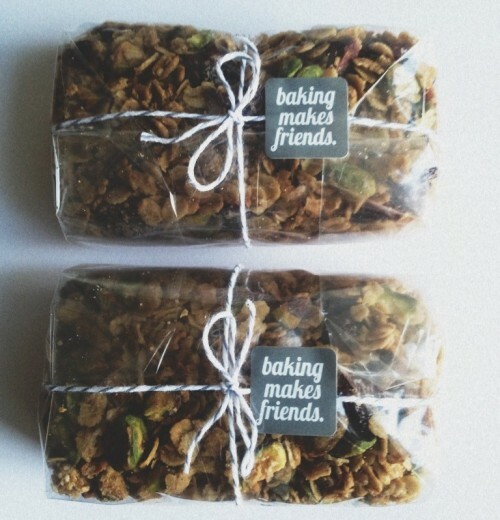 You can never have too many granola recipes, and I love how you’ve packaged this. I have to make some to send off to my daughter at college. I’m with you…I like breakfast foods enough, but not in the AM. This looks amazing, ditto on the packaging. A great recipe, a great sentiment, and some AMAZING packaging on the granola at the end there. 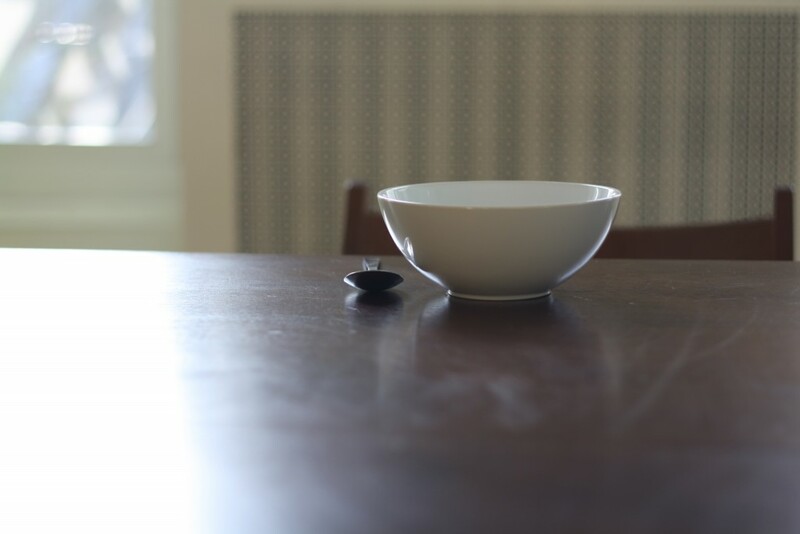 How could you resist that at the delicate hour of breakfast? 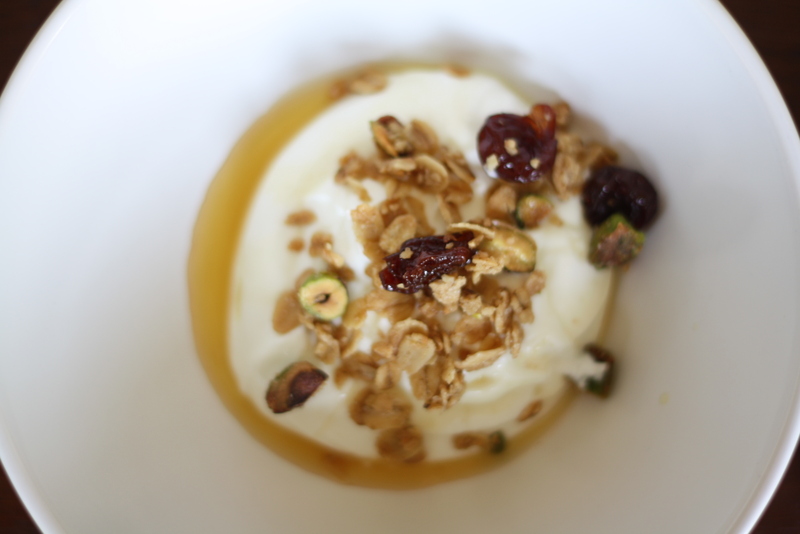 I love the maple idea, I’ve been wanting to make some maple granola myself. And the packaging is so fun! Hello! …i love the pureness of your photos, that’s so elegant and distinguishing! This seems to be a really good recipe , and the idea of eating homemade granola for breakfast makes me wanting to do it as soon as possible ! Thank you Anina. This recipe would lend itself well to other spices if cardamom is a bit too intense. Happy baking! I’ve never seen cardamom added to granola before! This is such a great idea! This sounds delicious, and what a nice twist on plain old granola! I was so excited and inspired when I found this recipe that I made an adapted version for my own blog! Thanks so much for posting this and everything else. I love your blog! i cannot even handle how delicious this recipe is. less than a week after batch number one, i am already getting to the end and plotting a double batch to take its place. so good.